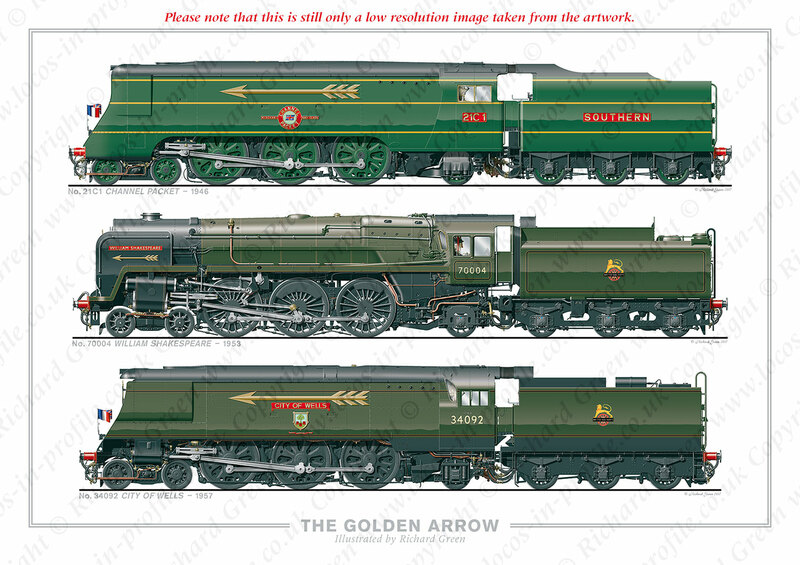 On the 15th May 1929, the Southern Railway introduced the Golden Arrow Pullman service between London Victoria and Dover to tie in with the Chemins de Fer du Nord’s Flèche d’Or between Calais and Paris, which had been running since 1926. The service ceased at the outbreak of the Second World War in September 1939. It was re-started after the war on 15th April 1946 and continued to be steam hauled, by various classes, until the final steam hauled trip on 11th June 1961. Electric traction then took over the service until it was withdrawn; the final working being on the 30th September 1972. No. 21C1 Channel Packet was the first of the Merchant Navy class to be built, designed by O.V.S. Bulleid to work express passenger trains. Due to smoke clearance problems the class went through many trials to improve the situation and by 1946 No. 21C1 had been fitted with what became the standard cowl and had flared out smoke deflectors. 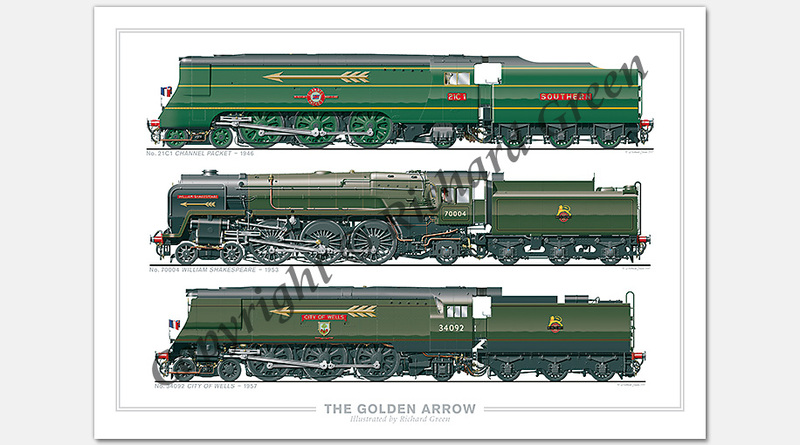 It was painted in gloss malachite green with horizontal yellow lines, but retained the cast number and tender plates. No. 21C1 was chosen to haul the publicity trip of the Golden Arrow on the 13th April 1946 and then the re-inauguration workings on the 15th and for the rest of the week. Built: (Eastleigh) February 1941. Rebuilt: (Eastleigh) August 1959. When the railway companies were nationalised the decision was made to produce a range of standard locomotives, overseen by R.A. Riddles, with the Britannia’s being the first to appear. No. 70004 William Shakespeare was chosen for display at the 1951 Festival of Britain exhibition and was given a special finish, with some of the metalwork polished instead of painted. After this a higher dome and SR lamp irons were fitted and it was allocated to Stewarts Lane and used on the Golden Arrow. Unfortunately, soon after, the coupling rods were bent while hauling the service near Headcorn. The driving wheels were modified and new plain front coupling rods fitted; returning to service in January 1952. By 1953 higher front lamp irons had been fitted. Built: (Crewe) March 1951. Withdrawn: December 1967. The light pacifics were designed by O.V.S. Bulleid to work over the restricted secondary routes of the Southern Railway, the class going through many modifications during its working life. Two naming themes were used; ‘West Country’ and the ‘Battle of Britain’. No. 34092 was originally named Wells, but this was changed to City of Wells in March 1950. It was named after the cathedral city in Somerset and carried the city shield. No. 34092 was allocated to Stewarts Lane shed and was regularly used to haul the Golden Arrow service, as well as being chosen for special workings. Built: (Brighton) September 1949. Withdrawn: November 1964. It has been preserved.